In the past, Chinese passport holders are not allowed to travel Vietnam with visa on arrival if they fly into Vietnam from China mainland directly. At that time, applying visa at the Vietnam Embassy or Consulates in China is the only way for Chinese passport holders getting a visa to Vietnam. Otherwise, they must travel the 3rd countries before flying to Vietnam with visa on arrival. However, things are different now! The Chinese citizens now feel free to travel Vietnam with a visa on arrival issued by the Vietnam Immigration Department regardless of whether they fly into Vietnam from China mainland or from the 3rd countries. Many Chinese passport holders choose the way applying for Vietnam visa at the Vietnam Embassy for their “peace of mind”, as their words, even it takes more time and money. Meanwhile, Vietnam visa on arrival is 100% legitimate as it is issued by the Vietnam Immigration Department, a government organization belonging to the Vietnamese Ministry of Public Security. In other words, visa on arrival is even more secured and convenient as you don’t have to send your passport off and the application will be processed online absolutely using SSL encryption technology. It becomes more and more popular and is used by million of travelers going to Vietnam today. ** Remember to prepare full the required documents for visa application at the Vietnam Embassy in China before coming there to save you time. 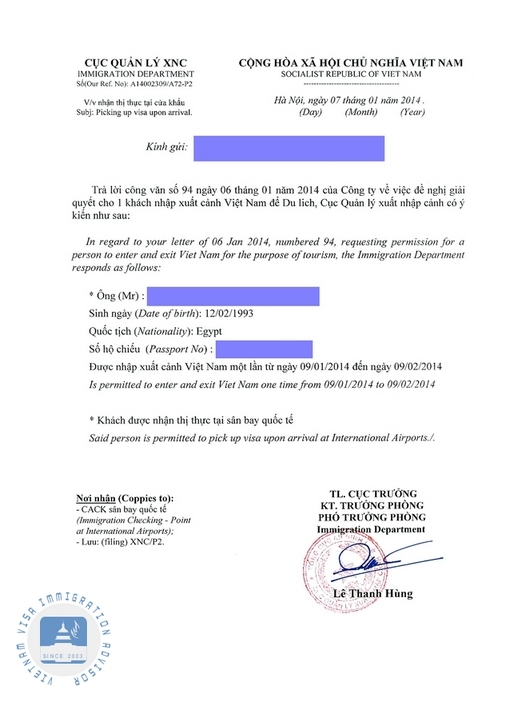 A business visa usually also requires a sponsored letter and documents from the agency or company in Vietnam. The process usually takes 5 working days (in person) or 2-3 weeks (by post) depending on the service you use. Visa on arrival is the process that you will apply for a visa online then pickup visa upon arrival airports in Vietnam – Hanoi (Noi Bai International Airport), Ho Chi Minh City (Tan Son Nhat International Airport), Da Nang (Da Nang International Airport) or Nha Trang (Cam Ranh International Airport). It is a legitimate alternative to obtaining a full visa stamp from the Vietnam Embassy in China with simple process and much cheaper cost. It is beneficial for those who do not have much free time to apply for visa in person at the Vietnam Embassy or those who is residing in the cities with no Vietnam Embassy or Consulates nearby. What the approval letter for Chinese looks like? Please make an application and take the experience on our services, we believe you will feel happy and satisfied. If you need further information about the visa service, you can check more at FAQs section or contact us for more support. How to get a last minutes Vietnam visa?